Duck Fat Chippies | Fat Is Your Friend! So we LOVE Duck Fat Chippies. Cooking chippies in duck fat is a really good idea… in fact it’s one of the healthiest and tastiest fats you can cook with! Why? Well, because duck fat has a super high smoking point (when oils/fats are heated past their smoke points, the fat starts to break down, releasing free radicals which can cause inflammation… we don’t want this). We cook with these oils. PLUS the taste… oh, the taste! Duck fat turns food in to delicious mouth fulls of gold (well golden, crispy goodness we guess!). The best thing is that you can re-use your duck fat! Talk about sustainable cooking right?! 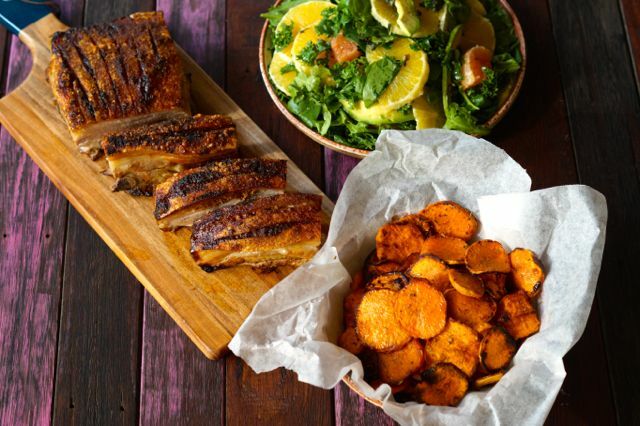 We suggest you serve your duck fat chippies with pork belly… or would it be serving your pork belly with duck fat chippies? Either way, you have a winning dinner menu that will leave everyone feeling extremely satisfied! Fat is where it’s AT! Fat is your friend. Read about fat here and embrace just how tasty and amazing real, wholesome food can be. ps. not keen on duck fat? Checkout all these crunchy chippie recipes! Peel and slice the sweet potato in to chippies! In a medium - high heat fry pan melt the duck fat. 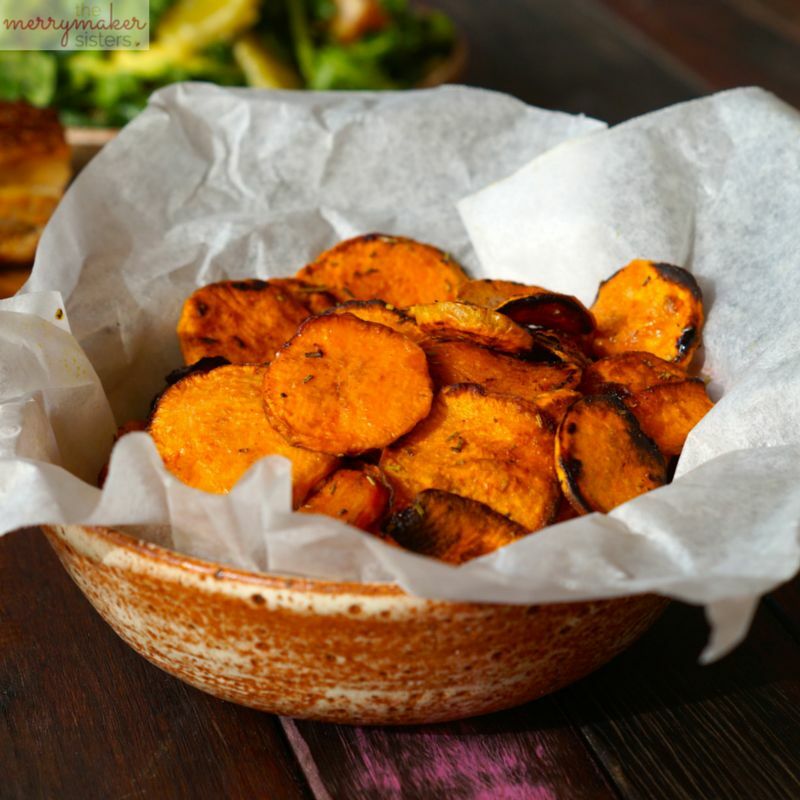 Once the fat is hot place the sweet potato chips in to the fat, cook for 3 minutes, turn the chips over and cook for a further 2 minutes. 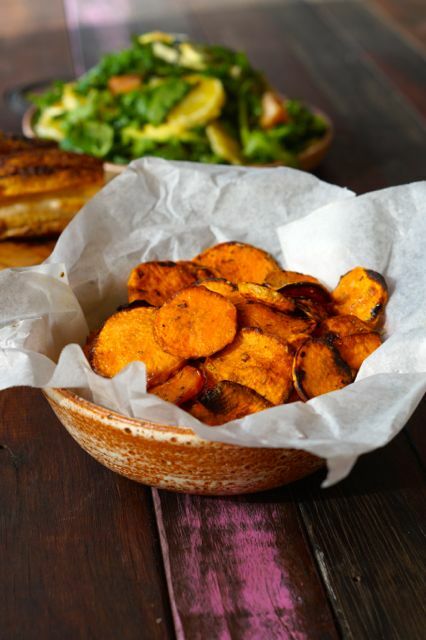 Set aside the cooked chippies and continue with the rest of the sweet potato pieces. Once all are cooked, sprinkle with herbs and season with salt and pepper! These go perfectly with pork belly! YES! Pork belly! Get the recipe above!